Does your school provide academic classes, or just ballet classes? Both – students enrolled in Ballet Tech’s full-time school (PS 442M) receive classical pre-professional dance training AND their academic classes all on-site at 890 Broadway. The school is a cooperative venture between Ballet Tech Foundation Inc. and the NYC Department of Education. Students in grades 4-8 receive both their academic and dance studies on-site. High School students continue their dance training at Ballet Tech while receiving their academic studies at Professional Performing Arts School (PPAS). How are children admitted into the full-time school? 1. THE “INTRODUCTION TO BALLET” PROGRAM: students who excel in Ballet Tech’s “Introduction to Ballet” classes are invited to apply to the full-time school. 2. OPEN AUDITIONS: students may audition directly for the school at one of our open auditions. Students who excel in the open audition are invited to take a class with the grade for which they are applying. Applicants may then be invited to participate in Ballet Tech’s Summer Session before a final decision regarding acceptance is made. At what grade level are children admitted into the full-time school? Ballet Tech’s full-time school starts at grade 4, which is when most of our students enter the school. However, we do transfer students in at the higher grade levels. Please note that students entering the upper grades (grade 6 and above) typically need prior dance training in order to successfully integrate into our school. Please click here for more information about admissions. What are your school’s average test scores? 2015-16 test results: 86% of our students scored at level 3 or 4 on the NY State Math exam and 77% of our students scored at level 3 or 4 on the NY State ELA exam. These percentages are well above city and state averages. Our NYC School Quality Snapshot is available here. More NYC Department of Education statistics are here. What is the “Introduction to Ballet” program and how do I enroll my child in it? The “Introduction to Ballet” program is a beginner series of ballet classes that Ballet Tech provides, free of charge, to approximately 500 3rd, 4th, and 5th graders each school year. Each year Ballet Tech auditions 30,000 children at 200 public elementary schools across NYC. Approximately 500 of the 30,000 who audition are selected to participate in the introductory classes. Students are bused from their elementary schools to Ballet Tech one morning a week for six weeks. Those who excel in the “Introduction to Ballet” program are invited to apply to our full-time school. Your school’s participation in the program is at the discretion of your principal – so please speak with them if you would like your school to participate. Please click here to learn more about the “Introduction to Ballet” program. How do I sign my child up for an open audition? Registering for one of the open auditions is easy – call us at (212) 777-7710 and speak with the receptionist at extension 300 to sign up. Please click here to view our upcoming audition dates and learn more about the auditions. How many dance classes do your students take? Ballet classes are part of all of our students’ regular schedules. It’s this simple: 4th graders study ballet 2 days a week, 5th graders 3 days a week, 6th graders and up study ballet 5 days a week. Dance classes are generally integrated into the regular school day. Do Ballet Tech students have opportunities to perform? 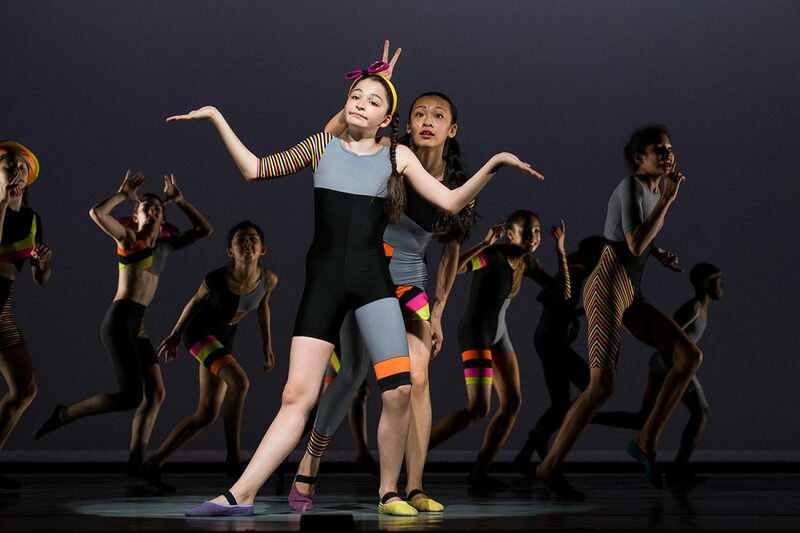 Yes – Ballet Tech students have the opportunity to audition for KIDS DANCE, our student performance group. Please click here to learn more about Kids Dance. What forms of transportation are available to your students? Ballet Tech’s students come from all over New York City. The Department of Education does not currently provide free bus service to Ballet Tech’s full-time students (though they do provide bus service for our “Introduction to Ballet” program.) Our full-time students are entitled to full-fare student Metro Cards. Some of our families sign up with a private bus service. The service has a monthly fee; the Ballet Tech Foundation helps subsidize the bus costs for those families with financial need. We also assist families who are struggling with transportation in finding other BT families who live near them so that they can arrange a buddy or car pool solution. The majority of our older students travel on their own. Does your school have an after school program? Yes – ROADS TO SUCCESS provides after school services to our students every day from 2:35 pm until 6:00 pm. There is a monthly fee, but the BT Foundation partially subsidizes the program in order to keep the cost for families down. Please click here to learn more about ROADS. Do your students go on field trips? Yes – our faculty utilize Ballet Tech’s central location in the city to take students on educational field trips. In addition students attend various dance performances throughout the school year to complement their dance instruction. Do students have a Computer class? No – but our school has laptop computers that are used in the academic classes. In addition, our teachers incorporate Smart Boards into their instruction.